The Panasonic Lumix ZS50 Travel Camera Bundle has everything you need to take professional-grade photographs. This affordable digital camera bundle is a great option for beginners and experts alike. The bundle includes the popular Panasonic Lumix ZS50 12.1 MP digital camera in Black. This camera is loaded with exceptional features that make it a great buy at around $329. The Panasonic Lumix ZS50 Travel Camera Bundle – What’s in the Box? Why Does a Camera with So Many Modern Features Have a 12.1 MP Sensor? Is the Panasonic Lumix ZS50 Travel Camera Bundle the Right Choice for You? The bundle makes it easy to start taking amazing photos straight out the box. With two memory cards, a tripod, carrying case, and lens cleaning pen, you will be ready to set out on a photography adventure and easily record each milestone along the way. Panasonic is recognized as a quality brand when it comes to cameras and other home electronics. If you haven’t owned a Panasonic camera in the past, this bundle is a great place to start. You don’t have to be an expert in photography to appreciate all the extras that you get with this affordable set. The Panasonic Lumix ZS50 is a point-and-shoot camera that features a 12.1 MP high-sensitivity MOS sensor. It operates on the brand’s Venus Engine image processing system which allows you to capture high-resolution images and Full HD 1080p videos. The camera works well in low-light settings thanks to the ISO at 6400. The Lumix ZS50 is capable of recording images at 10 frames per second, or at 6 fps with continuous auto-focus. This camera has a built-in Leica DC Vario-Elmar 30x optical zoom lens that offers a 35mm equivalent focal length range of 24 to 720mm. This can work for a wide assortment of photo opportunities as you zoom in your subject from a good distance. It is a great option for taking photos of wildlife either at the zoo or while exploring the outdoors. The zoom lens features are enhanced with Hybrid O.I.S. + Image Stabilization. This technology helps to reduce the appearance of a shaky camera and allow you work with greater magnification without distorting your image. Users can preview their images and monitor their surroundings using the large 3.0” LCD screen or the 0.2” electronic viewfinder. The screen also offers an extensive menu for accessing the settings including Panasonic’s Creative Control modes that help you edit your images to make them picture-perfect. Additional features on the Lumix ZS50 include built-in Wi-Fi which makes sharing your photos instantly easier than ever before, and the Control Ring that surrounds the camera lens and offers quick access to all types of adjustments, settings and features you can change and use while taking photos. The 12.1 MOS sensor and Venus engine work together to provide you with amazing results and brilliant images that you will be proud to share with others. Your photos will have a high level of clarity and minimal noise even on those shots that you zoomed in on. Images are recorded in RAW format which allows you to save your photos with greater detail. The imaging system operates at exceptional speeds and it includes a continuous shooting rate of 10 frames per second, or you can choose 6 frames per second using continuous auto-focus. The processor for the Panasonic Lumix ZS50 allows the camera to start up fast and helps the light speed auto focus feature work as it should. You will be able to take and retake multiple photos without missing any important shots when you purchase this quality bundle. Overall this is an exceptional bundle for a high-quality point-and-shoot camera and accessories. You have everything you need to get started taking photos right away. The two memory cards can store thousands of photos for you so that you will never run low on space. And the handy carrying case makes it easy to take your Lumix ZS50 on upcoming vacations. This is a nice bundle for beginners because it includes plenty of cleaning supplies to ensure that your camera will operate as it should as long as possible. There are several benefits and disadvantages associated with the Panasonic Lumix ZS50 Travel Camera Bundle. It’s important that you know about the good and bad aspects of this camera before you decide to make a purchase. While it is still a great quality camera, the drawbacks may cause some consumers to look elsewhere for a new point-and-shoot camera. The design of the Panasonic Lumix ZS50 is similar to previous ZS cameras from the brand. It features a compact size and a sleek, dark appearance that makes it aesthetically pleasing. It also features a larger grip which can be useful when you are taking those award-winning shots. The grip paired with the aperture ring help make the Lumix ZS50 easier to use. The sensor for the ZS50 is the same size as Panasonic’s predecessor the ZS40. However, this sensor has 50% fewer pixels. But that isn’t necessarily a bad thing. The pixels on this camera are about 50% larger, which allows them to gather more light and improves low light image quality. Reducing the resolution of the sensor may seem like a downgrade, but it actually improves the quality of the images you take. More recent pocket-sized travel cameras from Panasonic may have a little more to offer than the Lumix ZS50, but you will also pay more, and you won’t get the extras you would receive with this Lumix ZS50 travel bundle. However, if you would like a more current digital camera, the Panasonic Lumix ZS70K is a good choice. It features a tilt-angle screen, easy touchscreen controls, 30x zoom versatility, a mode dial and lens control ring for ease of use, and a 4K photo feature. It can be purchased for around $399 from most retailers. These days digital cameras must compete with the growing list of high-tech gadgets that feature camera capabilities. Smartphones are now capable of taking photos that can easily rival those taken with top-selling point-and-shoot cameras. These advancements have caused many digital camera manufacturers to come up with new and inventive ways to entice their customers, such as increasing the megapixels. Canon has recently gone so far as to create a DSLR camera that features a 120 megapixel sensor. While most experts will tell you that there is really no need for that many megapixels, consumers who aren’t in-the-know will often choose a new digital camera based on the megapixel size alone. The most common megapixel sensor size that you can find on the market now is between 24 and 30 MP. You can find many reasonably affordable digital cameras that offer this type of sensor from top-selling brands like Nikon, Canon and Kodak. So why did Panasonic choose to make their Lumix ZS50 with only a 12.1 MP sensor? It turns out that the lower resolution of this superzoom camera allows it to do a much better job at taking photos in low light conditions than cameras with a much higher resolution. Even cameras that are more expensive and claim to provide you with the best clarity and focus can’t compare to the results that you will receive taking photos in dim lighting with the Lumix ZS50. This camera has a compact size that allows you to easily slide it in your pocket as you take pictures on the go. This makes it a great choice for families with small children because you get to take amazing photos without lugging around a large camera as you keep up with your kids at the zoo or amusement park. The camera has an impressive 24-720mm field of view lens, which is something you don’t normally see on a small point-and-shoot camera. It is also rare to find a sensor so large on a camera this size. The Lumix ZS50 gives you all the benefits of a much larger digital camera in a compact, easy to hold package. When you travel you want to remember your experience forever, and that can be done by taking amazing pictures. It’s important to have a camera that is dependable, one that will take brilliant shots, and one that will not be a burden along the way. If you are planning a hiking trip or traveling on foot through an ancient city, you need to carry as few items as possible. This camera helps you lessen the load while you are enjoying your trip because it is so small and easy to carry around. This is the perfect digital camera for avid tourists because it packs all the best features of a much larger camera in a compact package. You don’t have to carry around an extra zoom lens, or deal with a large, bulky DSLR camera that’s too heavy to carry around while you are checking out the sights. The Panasonic Lumix ZS50 has a 30x zoom lens. It allows you to bring in your subject closer and much clearer than you would while using a lesser quality camera. If you frequently take photos in low light conditions, and are unhappy with the results, this camera can change all that. It can capture images that are crystal-clear, and many would say that the Lumix ZS50 takes low-light photos better than most DSLR cameras. While it will still pick up some noise in the background, that can be resolved by not adjusting the ISO levels as high. Do you have trouble getting the perfect live shot? The Live View Finder can help you snap clear photos while shooting a live event such as a sporting event, concert, or theatrical performance. It is a great way to frame the image that you want when the light conditions make it difficult to see the LCD screen clearly. The eye sensors help detect your viewing preferences as you switch over to LVF mode. The result will be stable framing and pristine visibility, even if you are taking photos in a dark theater. The top of the camera features a standard mode dial which allows you to shoot in the usual PASM mode. You can also choose from a variety of scenes to enhance your favorite photos, art filters for creative fun, and in-camera panorama capture. Along with the easy-to-use dial, you will find the shutter release and the zoom rocker the power button and the video record button. All located on the top of the camera for quick and easy access. 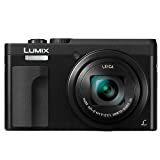 The Panasonic Lumix ZS50 Travel Camera Bundle features a compact, pocket-sized digital point-and-shoot camera that is loaded with plenty of useful features. It has a 30x zoom lens, RAW shooting support, and offers quick access to the features you use most. While it may be a little more expensive than other digital markets in the same category, this travel bundle will save you plenty on extra accessories, photo storage and cleaning supplies.